Fieldlens reports are built from the posts created by you and your project team, so sending a report doesn’t require any end of day paperwork. No more writing up what you saw on the jobsite or work that needs to be done! You simply choose what posts to include - and what details from those posts - and your report is done. We know that no two construction reports are exactly the same, and our reports are built to give you the flexibility you need, no matter the situation. 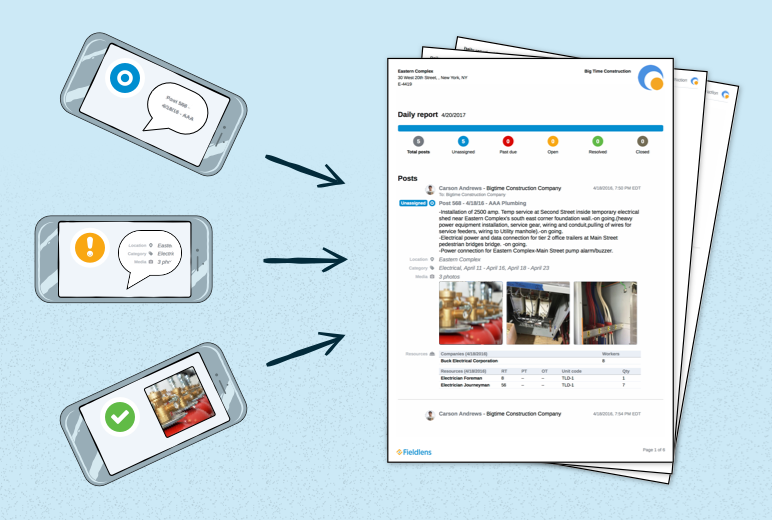 Whether it’s a Daily Report, Punch List Report or any other kind of report, Fieldlens enables you to pick and choose exactly what you want them to show. Automate them to run at the time of your choosing. For example, you can schedule a report to send at 6PM every weekday that will include all posts created for your daily report. Include an optional cover page with summary report stats such as open posts by assignee, location or category. Control the content to include or exclude post descriptions, comments and more. Control the picture and video thumbnail size - or exclude them altogether. Include your drawings within your Fieldlens report with clickable links to the supporting pictures and conversations. You can even print the full size drawings. Group posts in your report by assignee, project location, category or drawing. From both your mobile device and the web you can choose from several reporting formats (PDF, CSV) and select your formatting options. From the web, you can set a schedule and view a list of all the reports you’ve run or had shared with you.